i've delete the previouz 1 (sorry!!) .. it's bcoz i've uploaded it when the sitez down 4 a while! !Anotha self made bg .. usin' pathz in Photoshop .. the theme is nuthin' 2do with the game..!! (though i luv' it damn-much!!) .. i'm sick now..! !so pweaze gimme the cure..which is yerz criticz my great-Frenz!! i supposed somebody has ask some of the detailz which i do not use in the previous wallie!! ( i am plannin' it the 1st place )..! !thanx 4 botherin' just 2 put a comm. in my humble walliez..!! btw.. i am sick..my migraine is gettin' worst..!! well..anotha enigma here..u see the strange sign in the mid. of the circlez..( 4 ambigram wordz) .. it representz of the 4 basic elementz!! it doez has sumthin' connection with my previouz wallie ( the secrecy..)..well..again..just enjoy it!! WoW!! XD Another awesome wallpaper ryannzha!! I love the background very much. I like the wall and the floor. It is very detailed. You must put some craters in the moon to look it more realistic. ^O^ Download and set it to my wallpaper. thank alot for your cool work!!! Very intereesting looking wallpaper. that is one cool looking wall. its really cool. =^^= great work. i like the composition of it and the scenary is great too. 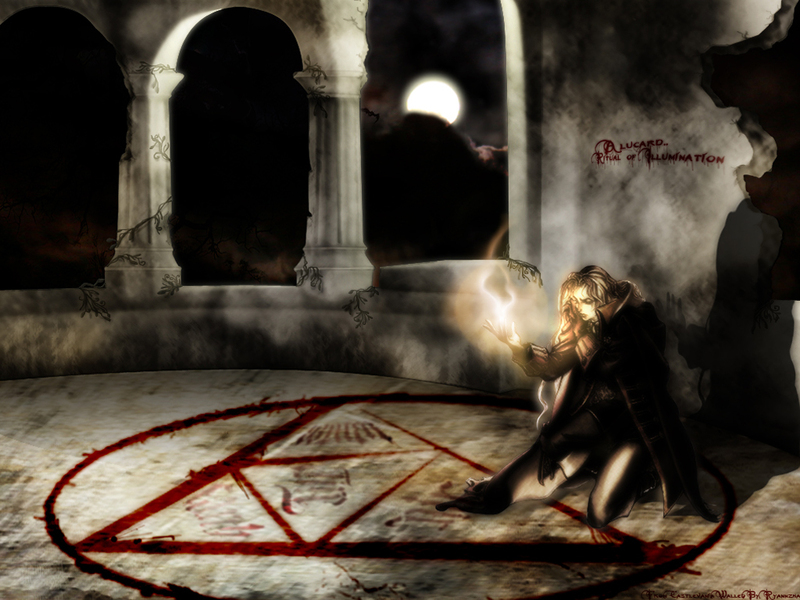 whoa, anotha awesome wallie from ryannzha ^_~ the luv the ritual sign on the floor, veri kool. howeva, the character is again a bit too small and a little blurry. the clouds near the moon is a little odd too ^^' but nonetheless, a great wallie =^^= do get well, ryan~! Hey rannzha, how are you doing?!? Cool wallpaper - even if it is a little evil looking ^^" Interesting scan used, and nice extraction of it...I love the context you have put her in, makes it look ultra evil! The detail is nice, and the colours are really complementing to that dark, grey, muddy-ness of what is going on. The shadow of the girl is a nice touch and looks really good because she's holding that light. The moon is another nice light source, and really helps to accentuate how dark it must be - like it must be near midnight, and how everything is set into place. Theres a nice texture on the floor, but it might need a little more defining from the little ritual symbol. I dunno what it is about it, its just looks a little too blended in, and I think if you defined the ritual symbol a little more then it would look just perfect. Good work and nice effort, keep it up! Wtheck only 7 comments for such a good wall?!? I just love the whole dark and dreary atmosphere of this wall. THe cloud work seems a bit too dark, especially to the left side but aside from that this is some more wicked work man. I like how you made the background! I cant do that stuff! Castlevania is cool! Great I like the moon and the clouds and the fire in his and but, the image of alucard can be improve? I add to my fav or course or curse? great work! the mystic aura around this wallie is soo natural it creeps me out! nice! I love the darkness of it. amazing picture.